Naoko Niimi published a paper on “A spontaneously immortalized Schwann cell line from aldose reductase-deficient mice as a useful tool for studying polyol pathway and aldehyde metabolism” in Journal of Neurochemistry. Dr. Mari Suzuki of Diabetic Neuropathy Project had won the Young Investigator Award (basic research section) of the 36th Annual Meeting of Japan Society for Dementia Research. Dr. Syudo Yamasaki (Mental Health Promotion Project), received the Best Poster Award from 20th International Congress of International Society for Psychological and Social approaches to psychosis. Yukiko Yoshida (Ubiquitin Project) published a paper on “Ubiquitination of exposed glycoproteins by SCFFBXO27 directs damaged lysosomes for autophagy” in PNAS. Masato Hosokawa published a paper on “Accumulation of multiple neurodegenerative disease-related proteins in familial frontotemporal lobar degeneration associated with granulin mutation” in Scientific Reports. Hikaru Tsuchiya (Laboratory of Protein Metabolism) published a paper on "Elucidation of the major pathway for proteasomal degradation" in Molecular Cell. Kaori Endo (Mental Health Promotion) published a paper on "preference for solitude, social isolation, and suicidal problems in adolescence" in Journal of Adolescent Health. Hisao Masai (Vice Director-general) received the 2017 Prize for MEXT Science and Technology (Research Category). Minoru Saitoe (Learning and Memory Project), is selected for winner of 19th Tokizane Prize. Naoko Niimi (Diabetic Neuropathy Project) published a paper on “A spontaneously immortalized Schwann cell line from aldose reductase-deficient mice as a useful tool for studying polyol pathway and aldehyde metabolism” in Journal of Neurochemistry. The increased glucose flux into the polyol pathway via aldose reductase (AR) in Schwann cells under high glucose conditions is recognized as a major contributing factor for the pathogenesis of diabetic neuropathy; however, little is known about the physiological roles of AR in the peripheral nervous system. Aldose reductase (AR), the first enzyme in the polyol pathway, catalyzes the conversion of glucose to sorbitol. The escalation of the glucose flux into the polyol pathway via AR under diabetic conditions results in the increases of advanced glycation endproducts (AGEs) and reactive oxygen species (ROS), leading to the development of diabetic complications. 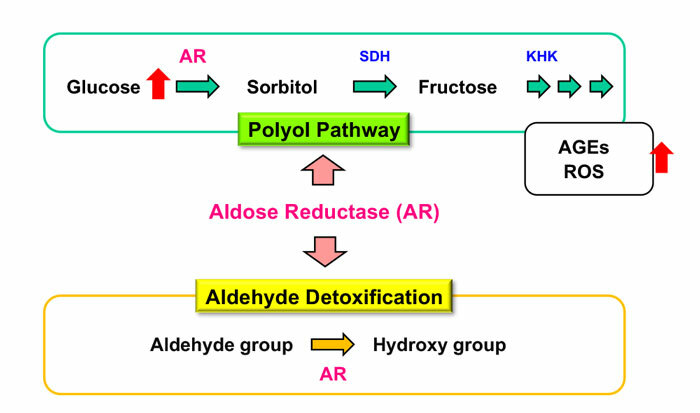 On the other hand, AR catalyzes the reduction of reactive biogenic aldehydes and plays a role in aldehyde detoxification. In collaboration with Hirosaki University, Sumitomo Dainippon Pharma Co., Ltd., Kyorin University and the University of Hong Kong, Dr. Naoko Niimi (Diabetic Neuropathy Project) and others of Tokyo Metropolitan Institute of Medical Science established spontaneously immortalized Schwann cell lines from long-term cultures of normal and AR-deficient C57BL/6 mouse peripheral nerves. These cell lines exhibited distinct Schwann cell phenotypes, such as spindle-shaped morphology, immunoreactivity for S100 protein, and synthesis and secretion of neurotrophic factors. Microarray and real-time RT-PCR analyses revealed significantly down-regulated mRNA expression of polyol pathway-related enzymes, sorbitol dehydrogenase and ketohexokinase, and significantly up-regulated mRNA expression of aldo-keto reductases and aldehyde dehydrogenases, in AR-deficient Schwann cells compared with those in normal cells. Exposure to reactive aldehydes (3-deoxyglucosone, methylglyoxal, and 4-hydroxynonenal) significantly up-regulated the mRNA expression of aldo-keto reductases AKR1B7 and AKR1B8 in AR-deficient Schwann cells, but not in normal cells. Because no significant differences in viability between these two cell lines after exposure to these aldehydes were detected, it can be assumed that the aldehyde detoxification is taken over by AKR1B7 and AKR1B8 in the absence of AR. These cell lines will be useful tools for studying the physiological and pathological roles of AR.